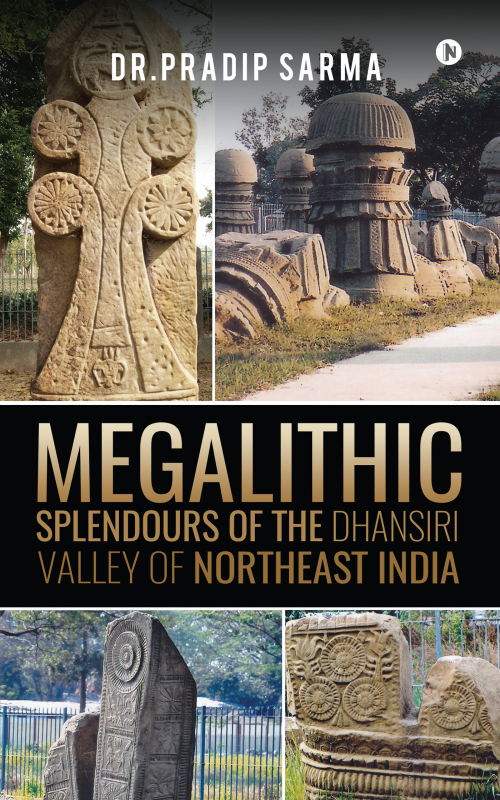 The Megalithic Splendours of the Dhansiri Valley of Northeast India is based on the field investigation and research conducted by Dr. Pradip Sarma on the magnificent megaliths of the ancient cities of Kachamari and Dimapur beside the Dhansiri River, a tributary of the Brahmaputra. The megaliths of the Dhansiri Valley, while maintaining their traditional link, are an assimilation of both Hindu and tribal art practiced by the Naga, Garo and some other hill tribes living around the Dhansiri valley. Studded with motifs and carvings of exquisite beauty, they are one of the finest examples of megaliths around the world. But these artifacts are yet to attract the attention they deserve from scholars and historians, even though they were discovered more than a century ago in a remote corner of the world. It is, therefore, a sincere desire of Dr. Sarma to throw the light on these unique structures so that they get a place in the history of humankind. Dr. Pradip Sarma is a popular name in the field of history and culture of Northeast India. He is known widely for popularizing investigative research in field archaeology, including ancient architecture. He has contributed several books in English and his native tongue, a few of which are Temple Architecture of Assam, Assam and Indo-China, Holy Shrines of Assam, Asamar Bilupta Maidam Parampara (The LostMound-Burial System of Tai-Ahom Rulers of Assam). A remarkable contribution of Dr. Sarma is his series of research papers and popular articles through which he has been able to establish linkage between the ethnic culture of the Brahmaputra valley with the greater Indian culture. In recognition of his contribution towards popularizing cultural history among the masses, the government of Assam awarded him the prestigious Literary Pension. An octogenarian, he is still actively pursuing the path of investigation and research in the field of the archaeological heritage of Northeast India.